Grady-White’s new Freedom 325 Dual Console is the third largest of its ten model dual console offerings for 2018 ranging from nineteen to thirty-seven feet. 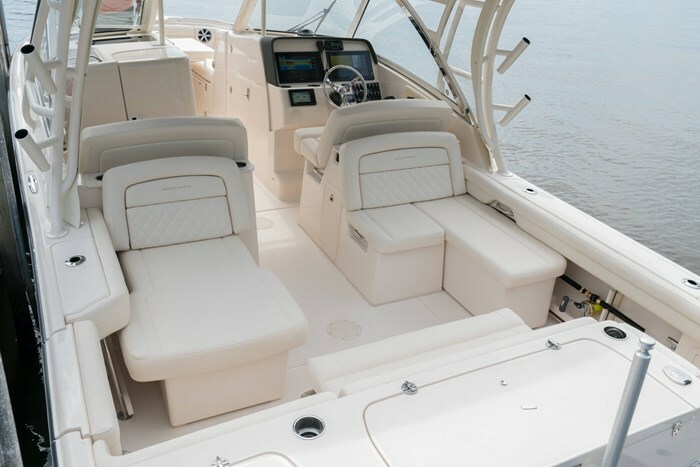 In all, Grady-White offers a total of twenty-nine models of center console, dual console, walkaround cabin, and express cabin models from eighteen to forty-five feet. 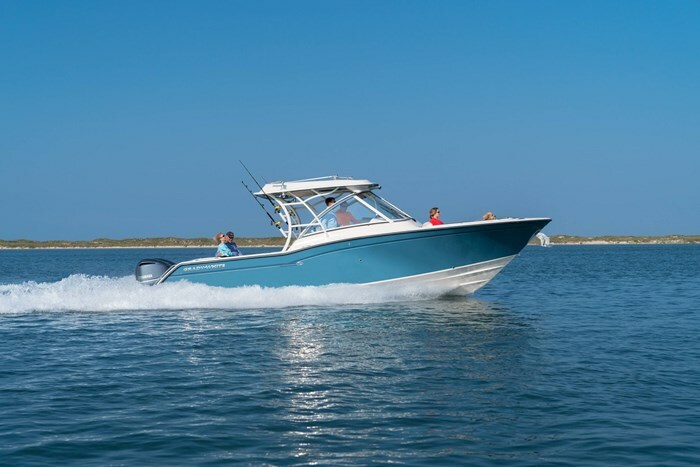 The Freedom 325 Dual Console rides on Grady-White’s exclusive SeaV²® hull and is designed and extensively outfitted as a versatile weekend boat for extended cruising, exploring, entertaining, and big water fishing. Choice of power is available from twin Yamaha 300 or 350 horsepower outboards which you may choose to have painted white. Very flexible and innovative cockpit seating is a highlight of the Freedom 325. Grady-White’s patented fold away stern bench faces port and starboard aft-facing seats located behind the raised driver and passenger seats. 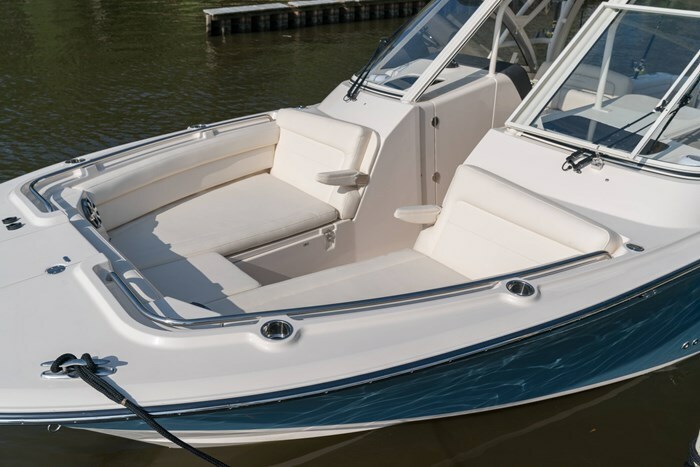 Each of these aft-facing seats feature electrically extendable seat bottoms to create a stretch out lounge seat on the port side or a lounge or L-shaped bench seat on the starboard side. The adjustable driver’s helm seat has twin flip-up forward bolsters. Bow seating is U-shaped, large and comfy with fold-down armrests on the forward facing lounge seating on the front face of the consoles. Beneath the very large hinged seat cushions on the starboard side is a 180-quart insulated fishbox with storage under the port side cushion. A fibreglass bow table is standard and convertible into a sunpad with cushions. Port and starboard recessed stainless steel grab rails virtually surround the bow seating area. On the foredeck is an anchor locker with standard windlass and raw water washdown. 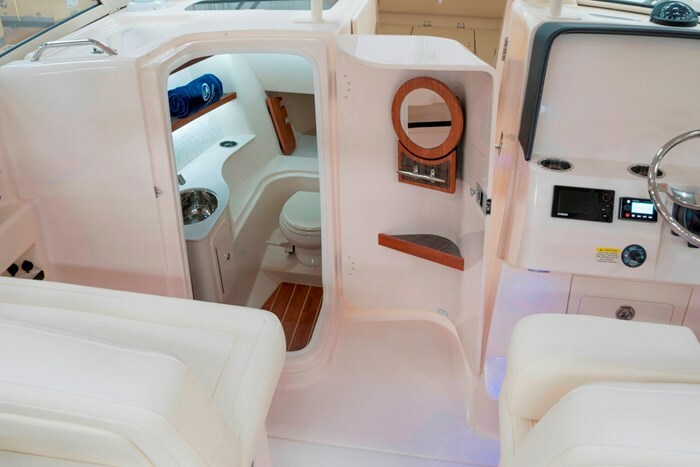 Within the port side console is a stand-up head compartment with VacuFlush® toilet, sink, and cedar-lined storage cabinet. 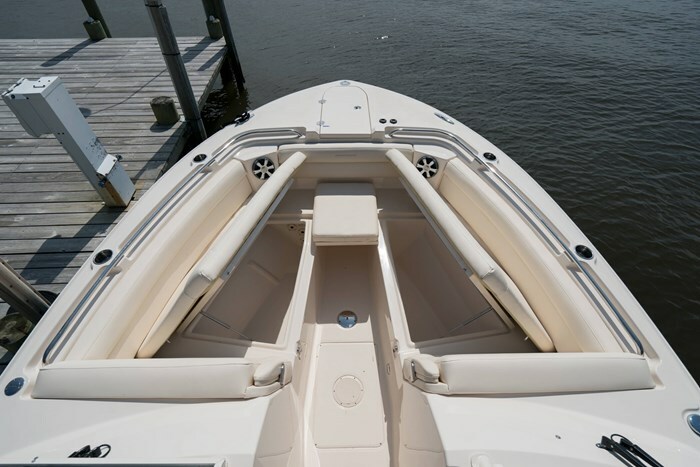 Access is provided into the storage compartment under the port side bow seat cushion to accommodate extra long items. Within the starboard side console ahead of the helm is a double berth with storage under the cushions or the entire compartment could serve as a bulk storage area. Both compartments feature cherry and holly soles. The hardtop on the Freedom 325 is supported by a painted aluminum frame and is integrated to the stainless steel header of the tall walk-thru windshield which itself has an upper centre opening section to provide ventilation plus standard dual pantograph wipers with washers. The hardtop has an opening hatch plus LED spreader lights, four side-mounted rod holders, outrigger plates, tri-coloured lights, storage net, flush mount electronics area, standard Ivory side curtains, plus a standard SureShade® electrically retractable cockpit shade cover with Sunbrella® Oyster canvas. The cockpit of the Freedom 325 is a fisherman’s dream but equally attractive and practical for the cruising and entertaining lifestyle. Padded bolsters surround the cockpit with toe rails on each side and blue LED courtesy lighting. Within the port hull side is a most convenient, practical, and useful side entrance door complete with boarding ladder and a starboard transom door leads to the extended swim platform sections, the starboard side of which features a recessed telescoping boarding ladder plus a molded-in storage compartment with cover. On top the transom is a port side 32-gallon livewell with light and cutting board cover and centred on the transom is a huge 254-quart insulated fishbox with a light. A port side in-transom cabinet contains built-in tackle trays. Also within the cockpit are three horizontal rod holders, four flush mounted rod holders, freshwater shower and washdown, raw water washdown, plus dual engine flush outlets. Pop-up cleats are standard as is dockside power with galvanic isolator and a battery charging system. The helm features a large flat surface for flush mounting of two large screens of your choice. Digital Yamaha engine readouts provide all necessary engine information. A tilting stainless steel steering wheel with knob and hydraulic steering with power assist is standard as are retracting trim tabs with indicators. The AM/FM stereo with amplifier has Bluetooth® connectivity plus MP3 port, remote control and six speakers. 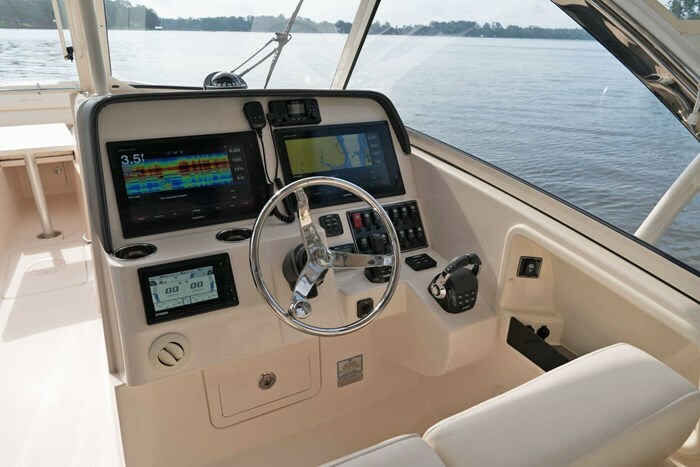 Since so much is standard on the Grady-White Freedom 325 Dual Console, the options list is relatively short, but most worthy. In addition to your choice of five hull side gelcoat colours, choose a 5kW diesel generator, bow thruster, Yamaha Helm Master™ control system, in-console air conditioning with helm outlet, outrigger kit, underwater lights, ski pylon, hot water heater, cockpit wet bar with sink and refrigerator plus optional electric grill, stereo upgrade, canvas options, and even a luxurious high-end deck chair.